A woman speaks with her family members who are in the US side, after 6 families gathered at the U.S.-Mexico border during the opening of the door at the US border wall in Tijuana, Mexico, on April 30, 2017. As of Sunday, the US government has been partially shut down for 16 days due to the Trump administration’s demand that a new funding package include money for a border wall with Mexico. The new House Democratic majority intends to vote on a bill to re-open the government that doesn’t include such funding soon after it’s sworn in. The administration and Senate Majority Leader Mitch McConnell (R-KY) have called the bill a non-starter. But ask anyone living along the US-Mexico line, and they’ll tell you: We already have fences and walls, drones and helicopters, surveillance towers, checkpoints, and border patrol agents speeding their ATVs across the fragile biotic crust of the desert. In fact, communities are suffering due to decades of militarization and border infrastructure. Today’s walls and fences already cover 700 miles of the 2,000-mile US-Mexico border, dividing towns and families, and causing damage to the environment and border communities, many of which are low-income, tribal, or on the Mexican side of the line. In October 2006, President George W. Bush signed into law the Secure Fence Act, which approved the building of additional border fencing. A year earlier, the REAL ID Act of 2005 included a provision that gives the secretary of homeland security power to waive any law deemed at odds with the “expeditious construction of physical barriers and roads” along the US border. Two hundred miles east during the same storm, a 5-foot-high concrete wall built across a storm drain by the US Border Patrol caused severe flooding in sister city Nogales, Sonora. This resulted in $8 million in damage, including damage to 578 homes, and the drownings of two people. Mexican officials declared the flood area a disaster zone. 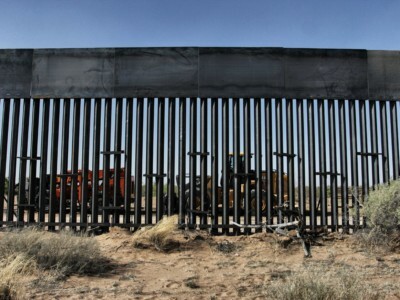 Not only are such walls structurally and logistically unsound, but some designs would violate a 48-year-old treaty between the US and Mexico regarding the construction of border structures that may affect the flow of the Rio Grande or its floodwaters. The 1970 treaty mandates pre-building approval of both the US and Mexican members of the International Boundary and Water Commission. In 2017, as Trump increased his rhetoric around building a wall, the IBWC’s chief Mexican engineer, Antonio Rascón, told NPR that he would block any proposal that violated the binational treaty. “A concrete wall that blocks trans-border water movement is a total obstruction. If they plan that type of project, we will oppose it,” he said. Your food relies on inexpensive undocumented labor to reach your plate. From Watersheds to Mountains: What if We Based Our Borders on Nature? Bioregionalism is one possible vision of a future that works for people and for the Earth.